The best resolutions are the ones that don’t require you to change your habits. 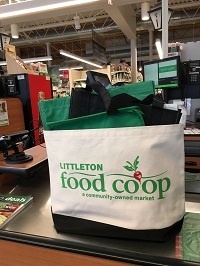 By shopping at the Littleton Food Co-op you are ensuring that your dollars stay in the local economy. It is easy to see how your money creates numerous jobs for community members. Behind the scenes, your money travels slightly outside the four walls of the store and into the pockets of local growers and producers. The buying power of the Co-op keeps some local businesses in operation and only serves to amplify the growth of others. 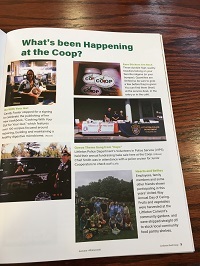 In 2017 the Co-op purchased $1.8 million worth of products from local producers. 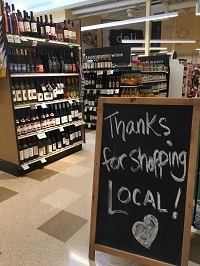 Keeping our money local creates a cycle of positive development that uplifts all aspects of our community. It is easy to go through your daily routine without thinking of how much plastic you are using. Only thinking about how much plastic you are using everyday can be overwhelming. There are a couple minor changes to your shopping habits at the Co-op that will reduce your plastic footprint. The first change is to use a reusable shopping bag to bring home your purchases. If your bags from home don’t find their way into the store, we have a wonderful selection of reusable bags available for sale. A second change is to shop in our Bulk department. You can bring your own reusable containers to the Bulk department to fill with whatever your heart desires. This reduces single use plastic from food packaging. 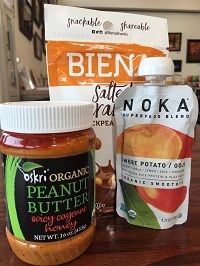 Third, you can find a variety of products in store designed to help you on your journey to being plastic-free, such as bee’s wrap, bamboo utensils, and glass water bottles. The new year is the perfect time to pick up a new hobby, and there is no better hobby than juggling. Lucky for you, we’ve removed the obvious biggest barrier to juggling–cost. 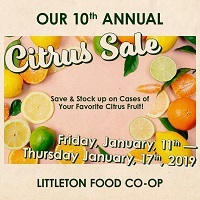 Our citrus sale is the perfect time to stock up on all your necessary materials. They come in multiple flavors like lemon, lime, grapefruit, orange, and miscellaneous citrus. And after you succeed, your materials are delicious to eat too. Your community should feel like more than just the place you picked your plot of land.  An easy method to become a greater part of the community is through the Co-op. The simplest option is to become a member of the Co-op. 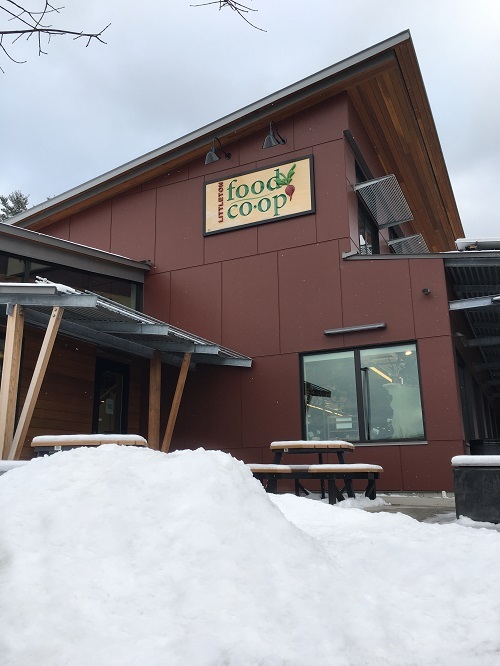 Co-op membership gives you a democratic voice and a network of over 6,000 other community members in exchange for the few seconds it takes to fill out the application. As a member, you can attend Co-op Board Meetings and learn more about the governance of your co-op. Everyone likes to feel like a part of something greater than themselves, and the Co-op is a great way to do that. We know, it’s a cliche one. But, we all know someone (maybe ourselves) who made this resolution last year but dropped it by the time the Valentine’s Day candy went on sale. One problem with this typical resolution is that it’s too vague. 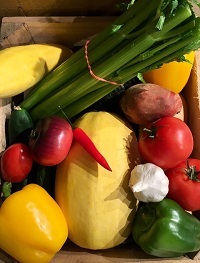 A modification to this resolution is to try a new eating lifestyle for a week or a month. You can be a vegan, vegetarian, pescatarian, heck even a pasta-tarian. Some people find that having a specific set of recommendations helps them make more conscientious choices. 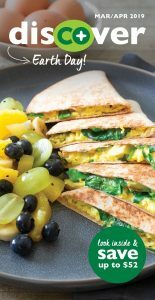 The Co-op offers healthy and delicious options to fit multiple types of eating lifestyles. For example, the Bulk department has a delicious organic and paleo granola for those following the Paleo diet (eating food similar to what was consumed back in the Paleolithic era). You live a stressful life; work, school, family, trying to finish your favorite show before your free trial expires. Every person deserves to indulge themselves in something that makes them feel good. It can be as simple as taking a nap, eating a treat, or trying a new relaxation technique.  While we do not recommend using our store for a nap (the floors aren’t that comfortable), there are plenty of other forms of self care that can be initiated through the products in our store. 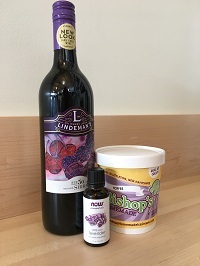 For example, stop by the store after work to grab a pint of local ice cream and bottle of wine to unwind after work. Or grab some essential oils to create a peaceful environment. Just don’t mix the ice cream and the oils. This can be a very difficult resolution to keep, especially when it’s zero degrees outside and more than zero degrees in your bed. However, if you can get from your house to your car, and then your car to the Co-op, you will find a number of exciting events taking place in the cafe. 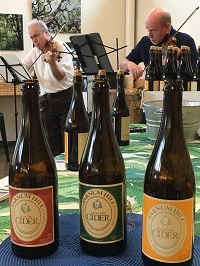 The cafe hosts beverage samplings, educational events, food demonstrations, and local non-profit events (just to name a few). 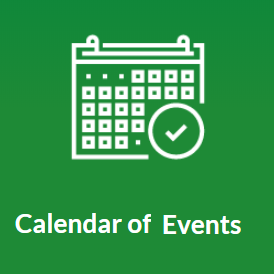 You can find your reason to get out of the house today on our Calendar of Events. Ever wondered what sweet pea smoothies tasted like? Or how spicy cayenne honey peanut butter feels in your mouth? Or what the heck is umeboshi paste?  Look no further than your favorite local co-op! With over 9,000 items in store, there is no shortage of new adventures to take in 2019. Pair with tonight’s dinner or stick it with tomorrow’s lunch. If you need food inspiration, check out our weekly newsletter for a recipe of the week. I bet that your house is currently littered with pamphlets from different nonprofits asking for donations in your household. We know you’re not actively against charitable giving when those letters end up in the recycling bin; it is an act that easily slips between the cracks in our minds. Luckily, donating to your favorite local nonprofits is no different than buying your food at the Co-op. 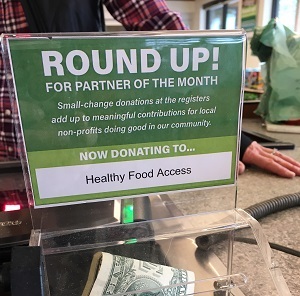 Every person has the opportunity to round up their change after a purchase to send it to our nonprofit Partner of the Month. Then, on Friday nights you turn off your oven for charity and purchase a Co-op pizza for Partners and Pizza night. You may feel skeptical of this idea, thinking “It’s only a couple of pennies.” However, every customer’s “couple of pennies” contributed to a total of over $36,000 in 2018 to a dozen good causes. You can use your resolution to help us reach our goal of contributing even more in 2019. We print more than just your receipt. 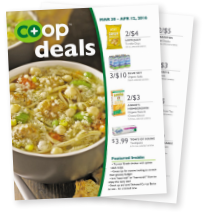 Signing up for our weekly newsletter will keep you in the know about Co-op sales and events. Our blog recommends our favorite drinks, foods, and recipes. 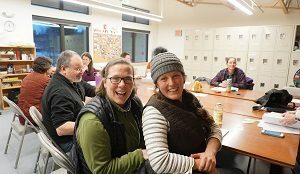 Our biannual Radish Newsletter gives you a glimpse of larger Co-op happenings and a look at where we’re going. Did you set any similar resolutions already for 2019? Did you break any similar resolutions already for 2019? Whatever your goals may be, we hope they bring you a happy and healthy 2019. This year is your year! 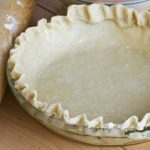 Never substitute baking powder for baking soda or vice-versa; they cause different reactions when combined with other ingredients. Make sure that your oven has come up to the required temperature before putting your baked goods in the oven. Have fun! Getting the little ones involved in measuring, mixing and decorating is a treat for them and the baker.